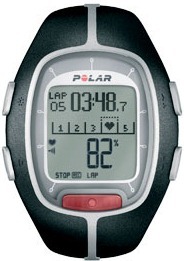 I’ve been using a Polar RS200 HRM for four days now. I’ve had a change to go out running four times (busy weekend…) and biking once. I’ll start from what I like: The Polar wrist watch is splendid, they’ve clearly though about usability: The display is large, buttons are easy to access, and the menu system is very intuitive, the rubber feels ok, and the whole thing is sturdy. Naturally having the ability to take this up to 50m deep (together with the HRM!) is a major plus, and I’m sure that it’s not an easy task to achieve, especially on the HRM side of things. Now for what I don’t like: The SonicLink stinks. Not so much the idea, or the transmitting side, but the software package that’s supposed to process the chirps and upload them to PolarPersonalTrainer.com. I had to go through three different computer/laptops/microphones until I actually got to a setup that worked. While in retrospect, I can now, AFTER finally getting it to work, can say that it’s probably all about the microphone, I have to say that the Polar WebLink tool is really sub-standard in terms of software engineering / usability. Polar thought of putting some indicator to help the users understand how good the microphone/settings they are using to record the chirps. Only one problem with it: It’s doesn’t actually work. Two computers where the UI indicated that everything is working properly within the proper sound levels were actually not setup properly (apparently). It took a third computer, where the level indicator indicated the the input level of the incoming sound is too low, according to the UI, to get it to work. I did manage to find a pretty nice open-source software package to do this though (too bad I was already half-way through writing my own RS200 decoder). This definitely works better than Polar’s stuff. The second (and more important thing) I don’t like is the (lack of) recorded data. Polar seems to be stuck in the 1990’s, and I’m not just talking about the RS200, I’m talking about their entire product line. While it’s not clear how some of the advertised features work (for example: at what rate are metrics recorded on the device for offline processing), I have to assume it has to do with the fact that I don’t actually own one, or have the SDK in front of me, rather than some omission on Zephyr’s side. I assume that the Hardness is not water resistant, which is minus when comparing it to the Polar naturally. I also assume it’s much more expensive than the Polar too. But you have to admit that it has a very high appeal rate for the outdoor aspiring geek. I bet there are a lot of interesting things you can generate from breathing rate, temperature, posture information etc. some of which I’m sure no one every thought of before: Zephyr have quite a few White-Papers and Studies done on the data they can pull off the device, that look quite impressive. Zephyr also has the HxM, which, while looking somewhat less Pro, seems to provide Distance and Speed information, though I might be mis-reading between the lines, since, if the accelerometer on BioHarness is accurate enough, I guess this sort of information can also be extrapolated from acceleration information. I plan to get one of these, one of these days, and start using it. Who knows, I might end up writing an iPhone app for it at some point. ~ by damageboy on November 1, 2009. I have the Zephyr HxM and it is water resistant, although not clear to what depth. the BioHarness should also be water resistant as it’s used by the US army and Fire Fighters. The speed and distance reported are actually the absolute movement (in all directions), so they’re about 30% higher than actual when running (horizontal only, checked against GPS and treadmill). Current revisions don’t distinguish between horizontal and vertical distance/speed. The BioHarness is water proof to 2m. Logging is a huge 20 days and USB rechargeable battery life is now 24 hours min. Having all these sensors in one has some cool features such as auto fitness test and detection of anaerobic threshold which is when you shift feul types and start generating lactate. Any endurance sport person should have a training session where they are improoving this mechanism. SDK for both devices are quick and easy. Android and Blackberry is easy. apple is making it difficult to talk serial Bluetooth to the iPhone without jail breaking.